You can automatically import emails into Quick Base to save time and reduce the errors that can arise from manually copying and pasting messages into Quick Base. After you import the Gmail to a connected table in your Quick Base app, it can automatically refresh in Quick Base, based on a schedule that you set. From the table bar, click New Table and then select Using connected data. Name your table, click Next, and then select Gmail. Enter your Gmail user name and password. Create your connected table. See Adding a connected table to your app or click the Help icon in the top right, while creating your table, and we'll guide you along. To view details about your connection and test, change, or delete connections, click the user dropdown on the Global bar, then click My preferences. Your connections display in the My Connections area. To view Details about your connected table, including the connected service, connection owner, connected fields, filter, and schedule for the connected table, access the connection in Table Settings. You can also view a History of recent refreshes, and edit the connection filter, refresh schedule, or switch to use a different connection, if necessary. Gmail has a handy feature that allows you to group responses together in a "conversation." With this feature enabled in Gmail, you can see all emails relating to one conversation inside a single email. You don't have to open several emails or search for a specific message to follow the conversation. When you use this query, you won't have to bring in individual messages, and you can create just one record to contain a series of related messages. This reduces the number of records in your table and makes it easier to manage related customer communications. # Thread Count is a summary field that shows the number of messages in the conversation. Original To is the email address of the first recipient of the message. Original From is the email address of the first sender of the message. When you import a Gmail conversation into Quick Base, each conversation will appear in a single block in your table, with the latest message at the top. Many businesses use Gmail for their company's communications. 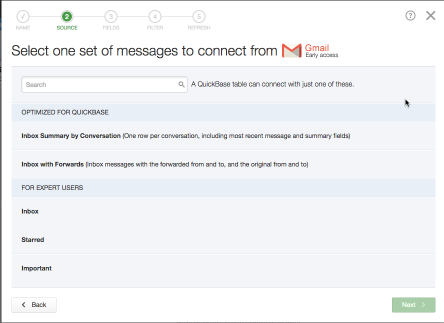 Here's a common scenario that illustrates how connecting a table to a Gmail account will enable you to track customer emails by importing them to Quick Base. Let's say your sales reps send and receive emails to customers. To track them in a central location, sales reps forward these emails to a central Gmail account. To get these emails into Quick Base, set up a connection to this Gmail account. OriginalFrom The email address of the customer. OriginalTo. The email address of the sales rep who received the message. Forwarded From The email address of the sales rep who forwarded the customer email to the central Gmail account. Forwarded To The email address of the central Gmail account. When you connect to the Gmail account, you select these fields and Quick Base will extract the customer's email address from the body of the email and import them to your Quick Base table.